I usually leave my PayPal funds until I need a little bit of extra cash then only cash out, it is not good to practice like that. Now, as a Malaysian, we are not just only can withdraw the Paypal fund into credit card/debit card but also can withdraw into local bank account directly. Those Internet savvy now can withdraw their PayPal fund to Malaysia Bank Accounts through bank swift code. 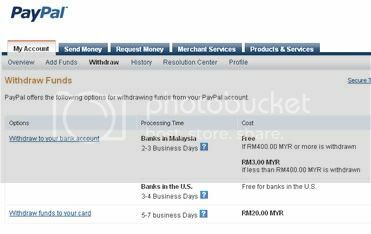 Based on the information that I’ve obtained from Paypal official site, I only know that the transaction will take up to 2-3 days, and a fee of RM3 will be charged if your withdrawal is below RM400. If your withdrawal is above RM 400, you will be waived from the fees. Step 1: Login your PayPal account. Step 2: Click “My Account” then “Withdraw”. Step 3: Then, click “Withdraw to your bank account” link under the options. Step 4: Next, enter the amount in USD you want to withdraw and select your bank account. If you still not yet add the bank account, then proceed to step 5 else go to step 7. Step 5: Fill in your name, bank name, bank routing code, and bank account number. Step 6: After that, you will be asked to review the details. Click “Add Bank Account” button if everything is OK. Step 8: After you clicked on the “Submit” button. Your withdrawal request is pending to process. So, you need to wait for 2-3 business day and your PayPal money should be in your selected Malaysia bank account. Note: If let say your provided details not correct, PayPal will charge RM15 if the funds are returned. If you want to know how to withdraw fund into credit/debit card, then you can try to visit this iCalvyn.com site. This entry was posted on Sunday, February 28th, 2010 at 1:19 pm	and is filed under Paypal. You can follow any responses to this entry through the RSS 2.0 feed. You can skip to the end and leave a response. Pinging is currently not allowed. good news for me! I was wondering how to cash out my paypal! thanks! Just to share I withdrawn twice from paypal and it takes around 7 days to appears on my local bank account. Run online business and sell things/service online and you will have USD in your PayPal. Ok. I have an english and chinese name (offcial in IC). E.g. : Michelle Tan Soo Mei. I registered with paypal using my last name, first name: Tan, Michelle. But in paypal, for my bank account (citibank malaysia) you can only input your first name, last name is fixed. So, I input Michelle Soo Mei. Withdrawal worked. Be patient for the money to show up in your bank account. Paypal will give u an estimate as to when it will appear, it is usually correct. But I kinda hate paypal for making me go through the limitation issue. I don’t have a scanner, troublesome. Those idiots. and they took soooo long!